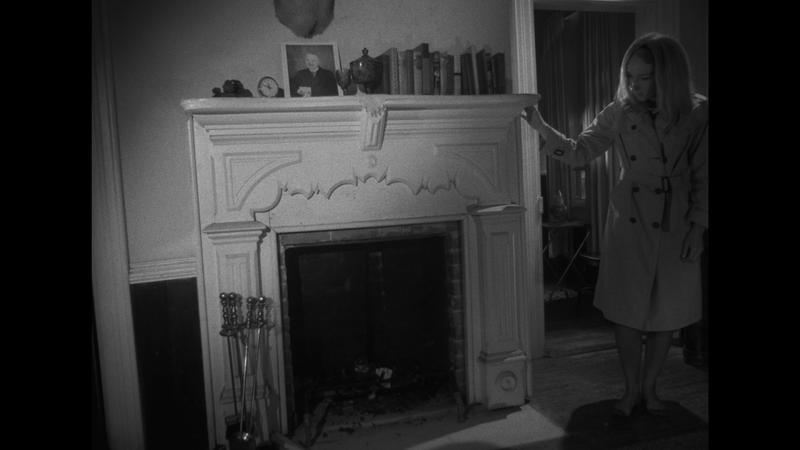 A horror classic gets a new lease on life with this new blu-ray from The Criterion Collection. 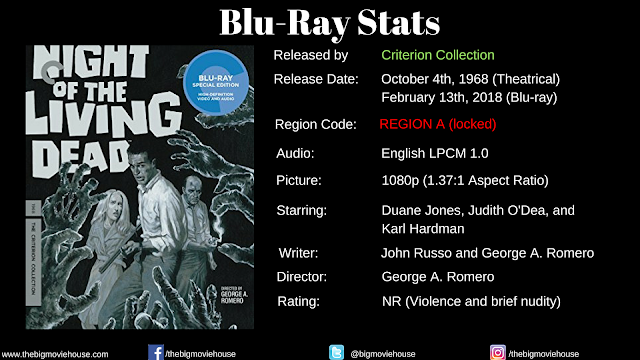 Recorded for the 1994 Elite Entertainment Laserdisc, this track features Co-writer/director George A. Romero, producer/actor Karl Hardman, actor Marilyn Eastman, and co-writer John Russo. Also recorded for the 1994 Elite Entertainment Laserdisc, this track features producer/actor Russell Streiner, production manager Vincent Survinski, and actors Judith O'Dea, S.William Hinzman, Kyra Schon, and Keith Wayne. 10. 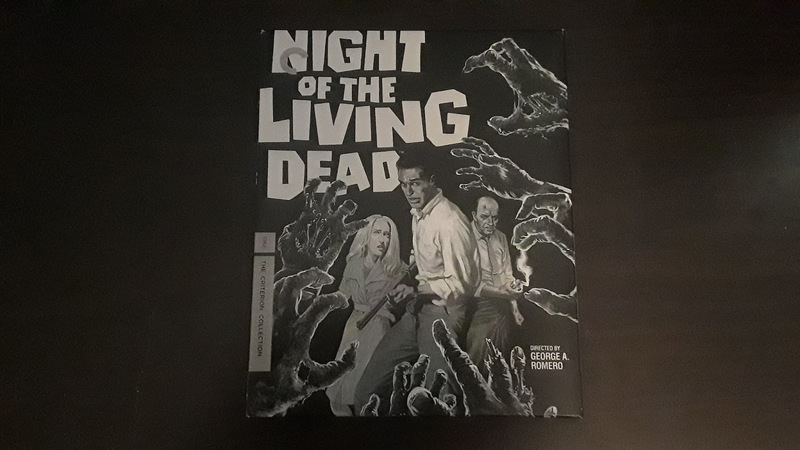 "That is a neat radio"
This is the workprint version of Night of the Living Dead that was shopped around to investors in order to get more money. 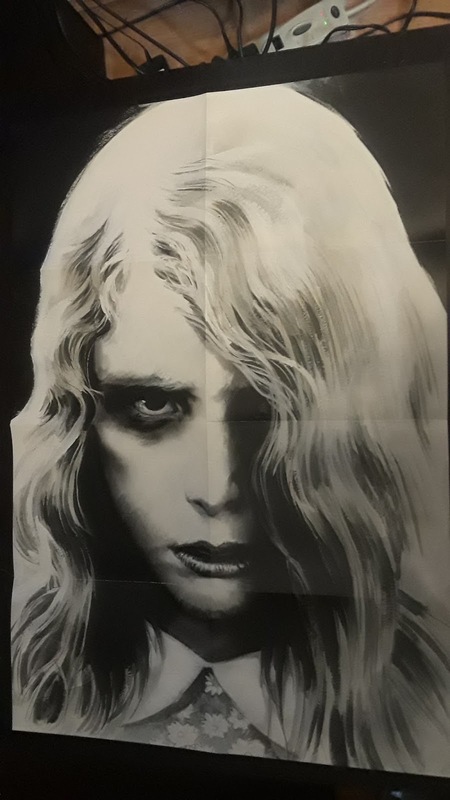 This workprint comes from a 16mm version of the film that contains an alternate opening title and a day for night ghoul shot that was removed at the request of the original distributor. 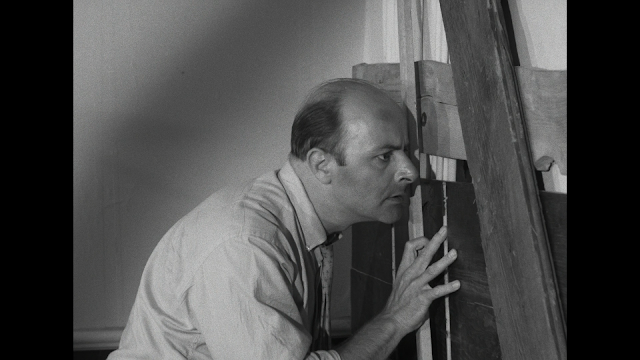 Streiner describes what editing on actual is like and why this workprint exists. He talks about the workprint’s imperfections (splicing tape for every edit, uncorrected picture, etc) and how the workprint’s sound has been lost, so the sound from the finished film had to be edited into this version of the film. Even though this is a short special feature, I found it incredibly informative and think that it is one of the better special features. 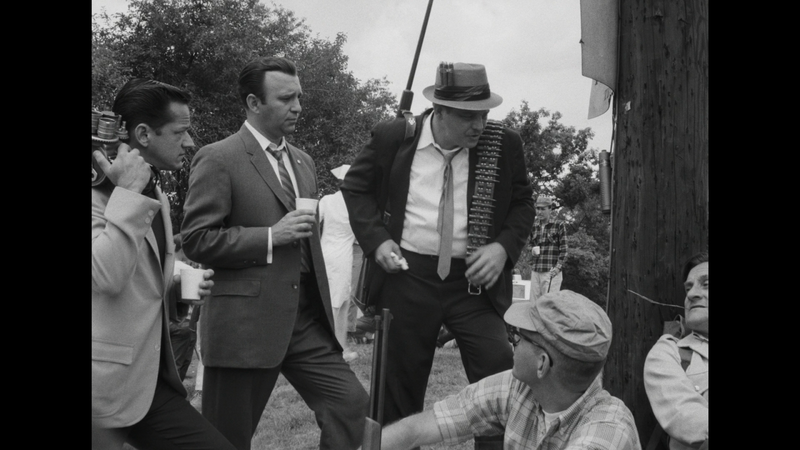 Made for Criterion in 2017, this featurette features Frank Darabont, Guillermo del Toro, and Robert Rodriguez talking about the film, its style, and it’s impact. Basically sets up the dailies and what dailies are. 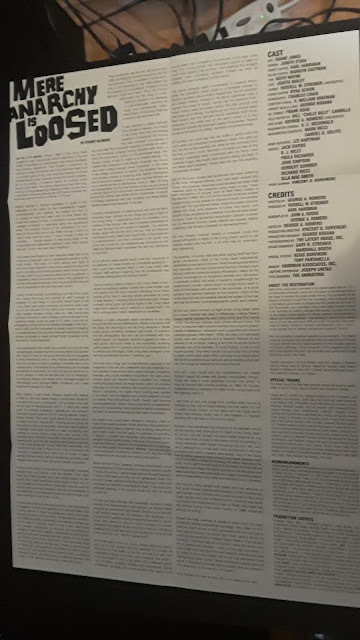 Made for Criterion in 2017, this is an interview with John Russo who remembers The Latent Image, the commercial and industry-film production company in which he and Romero were partners. VHS recording of silent, B-roll 16mm shot for a local Pittsburgh news broadcast. This footage contains the only known behind the scenes footage for Night of the Living Dead known to exist. 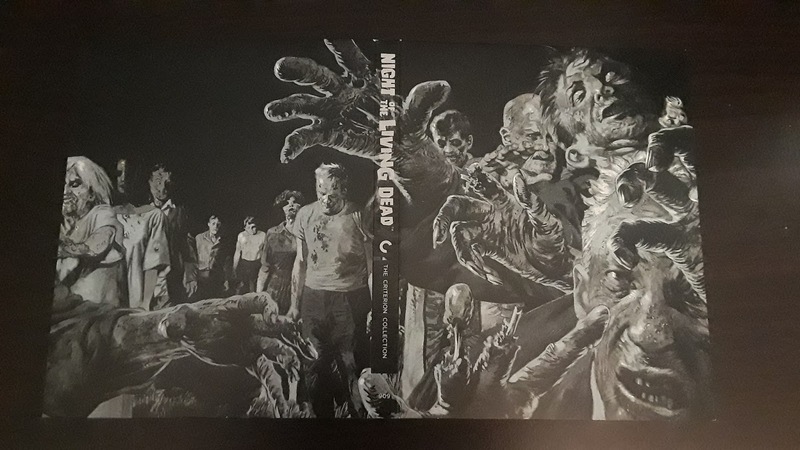 Made for Criterion in 2017, this featurette contains footage of ten cast and crew members talking about what it was like to portray cinema’s original flesh-eating ghouls. Interviews were shot for the 2009 documentary Autopsy of the Dead. 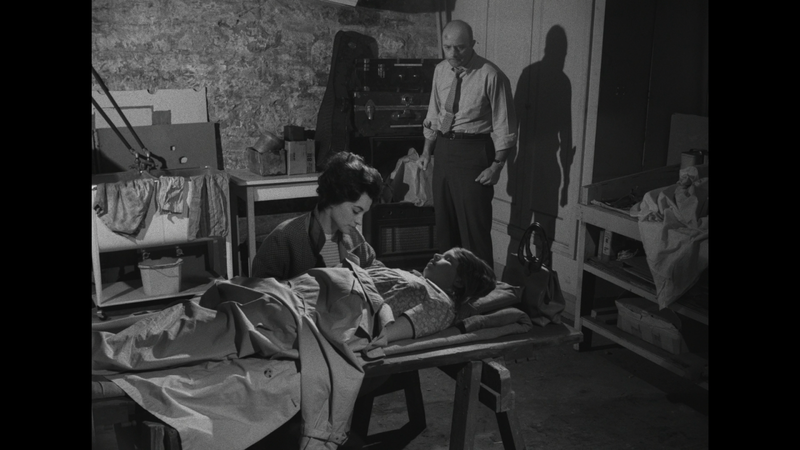 Made for Criterion in 2017, producer Jim Cirronella (Autopsy of the Dead) delves into the skillful use library music in Night of the Living Dead. 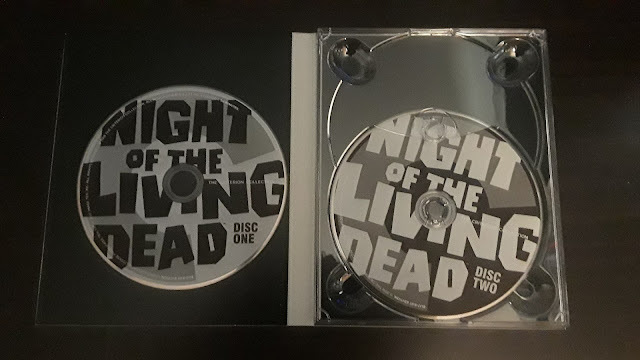 This is one of the best special features on this disc, Cirronella talks about what library music is, the different kinds of library music, and the differences between the use of the same music in NotLD and other films. Made for Criterion in 2017, this is a video essay from Tony Zhou and Taylor Ramos who created the Youtube channel Every Frame a Painting. Zhou narrates this piece that looks at the limitations that the cast and crew faced and how they turned them into virutes (hence the title). Edited excerpts from the July 3rd, 1979 episode of NBC’s Tomorrow, where host Tom Snyder discusses the mechanics of the horror genre with George A. Romero and Don Coscarelli. I used to watch shows like this with my parents when I was little, so this is a bit nostalgic for me. This was made when the horror genre was covered on the major networks. Footage from a November 2nd, 2012 Toronto International Film Festival (TIFF) event hosted and moderated by Colin Geddes where Romero discusses Night of the Living Dead. Romero talks about a bunch of his films, the Dead series is always front and center. 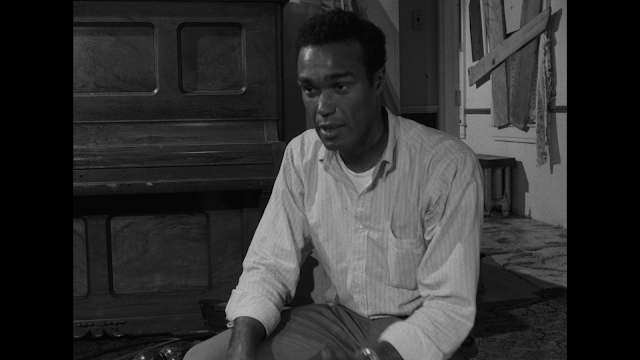 December 13th, 1987 audio interview with Duane Jones. Illustrated stills and clips play under the audio. This version of the interview is five minutes longer than any other version. 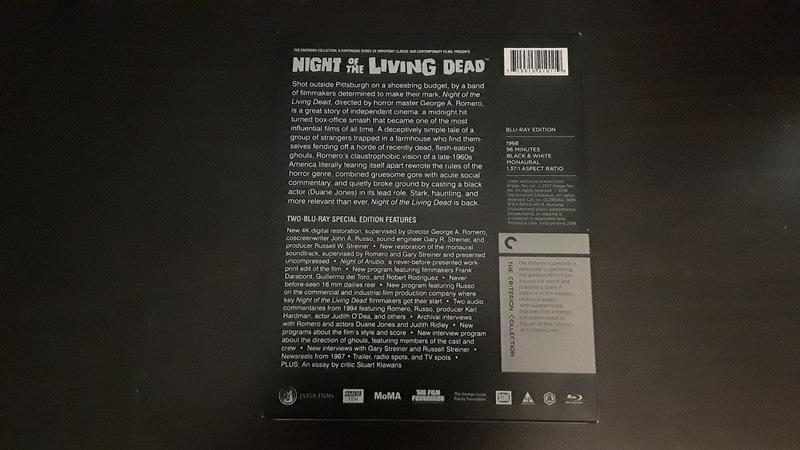 Produced by Elite Entertainment for their 1994 Laserdisc of the Night of the Living Dead, Ridley discusses her role in the film. 1967 newsreel of the Mariner 5 that went to Venus. Because of how short it is, I really see no reason as to why this is here other than to say that it is similar to the probe in Night of the Living Dead. It is so short that, by the time I had written down the runtime and video quality, it was over. Note: The only special feature that has appeared on other releases of Night of the Living Dead, including the Japanese blu-ray, is One for the Fire, a documentary about the making of the film. Would have been nice to have included here, but, for whatever reasons, it is not. Those looking forward to retiring the Happinet blu-ray will have to hold onto it if they want this making of. Criterion has done an amazing job with Night of the Living Dead. The previous blu-ray, from Happinet, looked good, but it didn’t look this good. There is a high level of detail and a thin layer of grain. Most home video presentations of the NotLD have been murky and washed out, but everything is so clear here. There is also no damage to the print, which is a shock given the film’s public domain status. Everything here is sharp and looking great. There is one track offered here: an English LPCM 1.0 track. The track sounds nice with dialogue crisp and clear. The library score that was used for the film sounds great and there are no distortions to the track that were not there from the beginning. 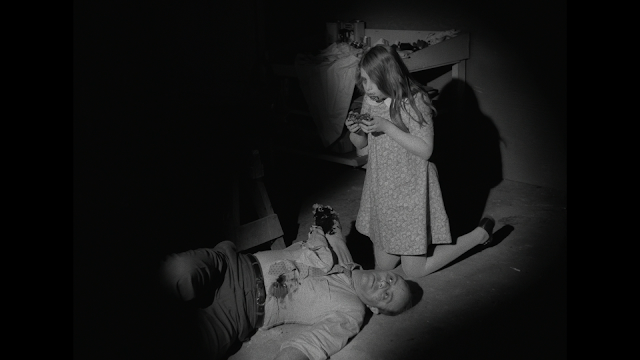 Barbara and Johnny visit their father's grave in a remote cemetery when they are suddenly set upon by zombies. 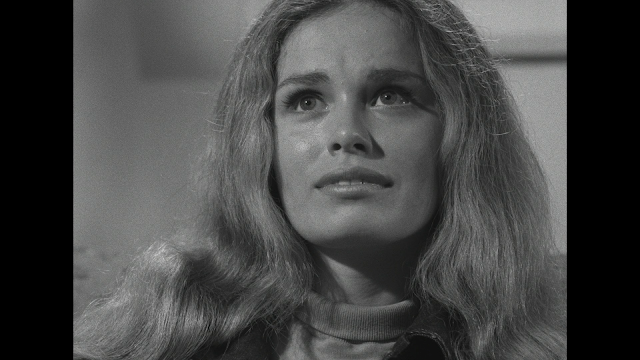 Barbra manages to get away and takes refuge in what seems to be an abandoned farm house. She is soon joined by Ben who stopped at the house in need of gas. Beset by the walking dead all around them Ben does his best to secure the doors and windows. The news reports are grim however with creatures returning to life everywhere. 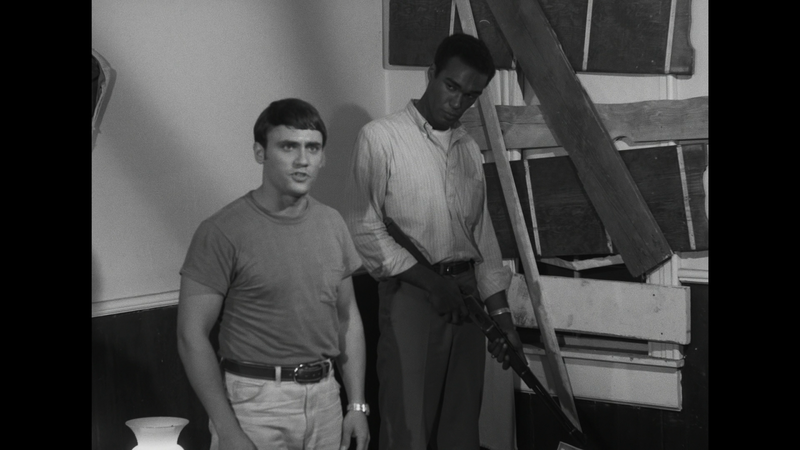 Barbra and Ben are surprised when they realize there are 5 people hiding out in the basement: Harry, Helen and Judy Cooper; and a young couple, Tom and Judy. 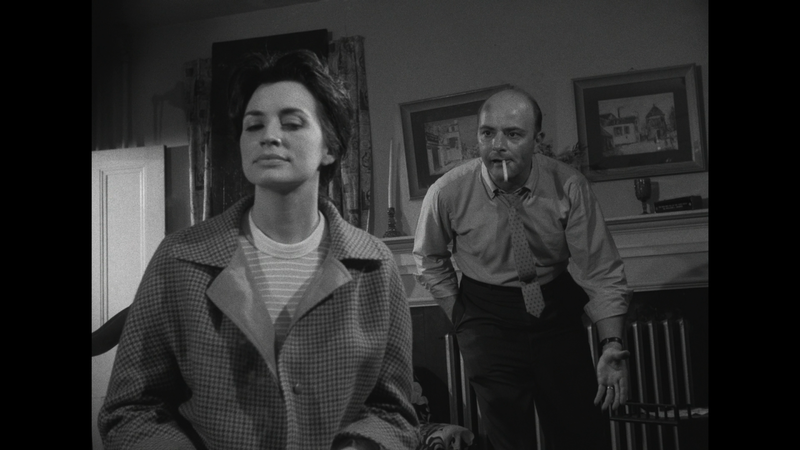 Dissensions sets in almost immediately with Harry Cooper wanting to be in charge. As their situation deteriorates, their chances of surviving the night lessen minute by minute. 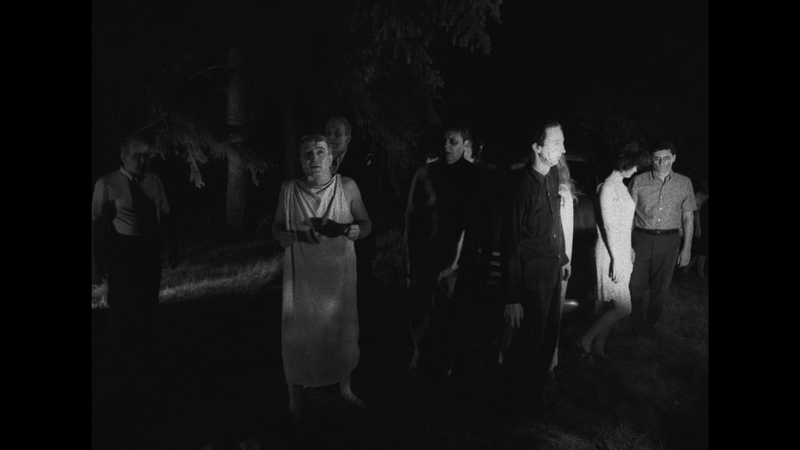 Night of the Living Dead is one of about ten films that can be considered an all-time classic without any backlash. The film took the idea of “flesh eaters” and combined it with the “siege film” to not only make a great film but to make a film that is still inspiring filmmakers today, and not just in the horror genre. Films like John Carpenter’s Assault on Precinct 13 and Panic Room owe just as much to George A. Romero as they do to John Wayne and John Ford. 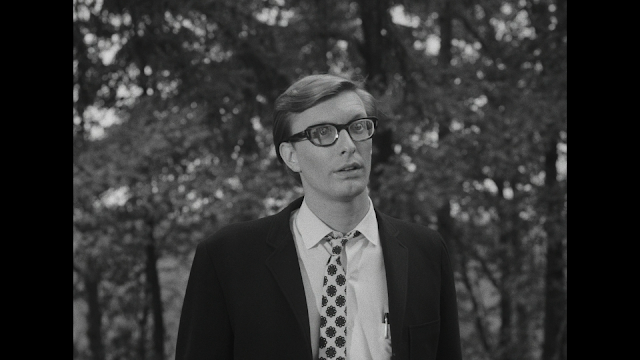 The problem in reviewing a film like Night of the Living Dead is that there is nothing more to say about the film. This year marks the film’s 50th anniversary and just in the last ten years there have been at least ten documentaries about the film and its impact and that doesn’t even count the ones made by YouTubers. The film has been looked at from every angle and every cut and choice that Romero made has been put under a microscope. 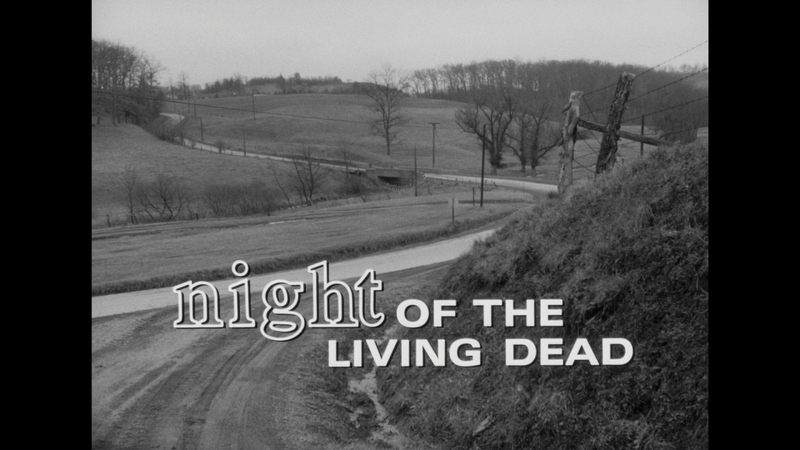 Needless to say, but there is nothing about Night of the Living Dead that hasn’t been talked about. So where does that leave me? How do I review a film that has already been dissected to death? I figure that I will talk about the first time that I saw the film and how the film impacted me. I was about five or six years old when I saw the film. My mother had rented a few films for her and her sister to watch when they got together to do laundry. I can’t remember the other films in the stack, but they had to be horror films because that is all they watched on laundry day. I remember looking at the titles and the only one that jumped out at me was Night of the Living Dead. I took the VHS tape from the stack and put the tape into the VCR. 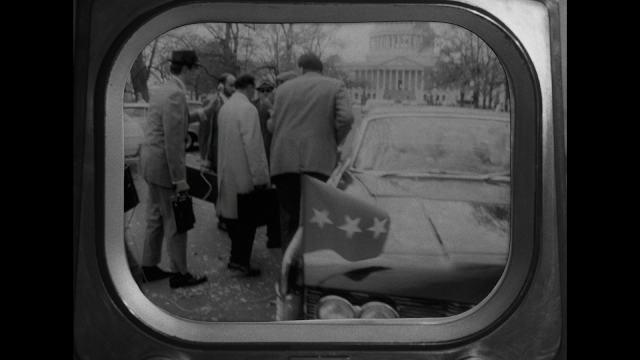 The first thing that I remember was that the film was in black and white. This didn’t bother me, and never has, as I always watched I Love Lucy reruns with my mom. 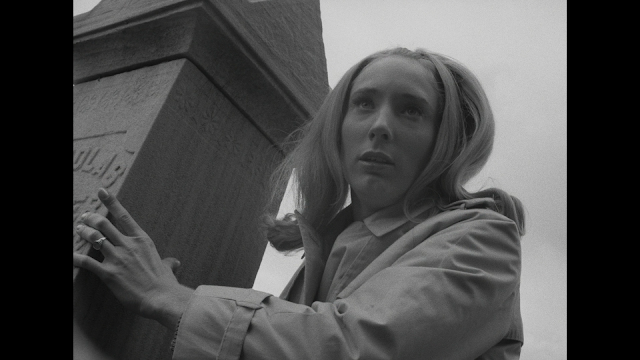 The opening scene didn’t really scare me too much as I never had visited a cemetery before. Once the Barbara got to the house, though, all bets were off. The house in the film didn’t look like my house, but it did look like my dad’s dad’s house (no, you did not read that wrong. It is a long story.) and we spent a lot of time there. 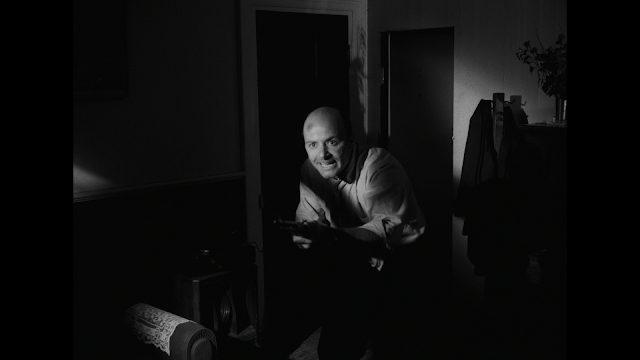 The fact that the rest of the film lasted there would go onto to scare me for quite some time. Everything in that house reminded me of his house and it should. Both houses were in the middle of nowhere, surrounded by farmland. Both houses held a creepy vibe to me and both had dark, creepy basements. I also thought that it was kind of weird that the Barbara didn’t really do anything. Once she made it to the house, she just sat there, or if running away was needed, then she did that. She didn’t really help in fortifying the house and when her death came, I was moved one way or the other. The character that I responded to the most was Ben. 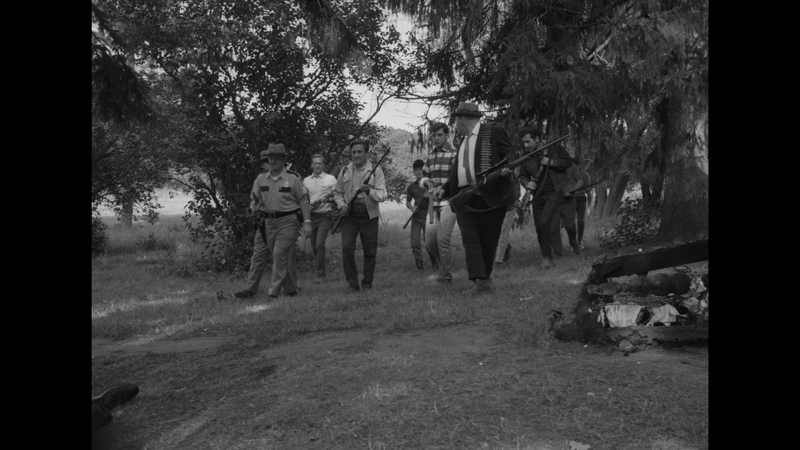 Sure, I wasn’t a black guy (still not), but he was the leader of this ragtag group of people just trying to survive. He was headstrong and knew what to do and would get in people’s faces if needed. 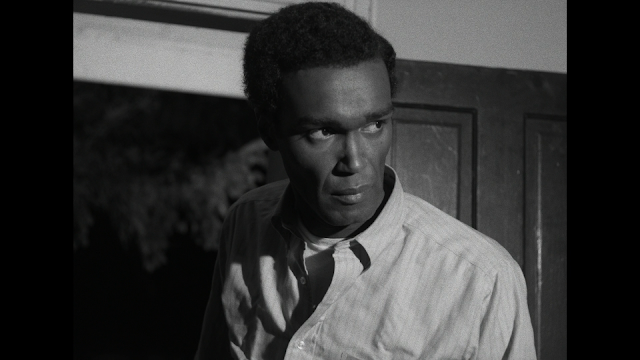 Hell, he was the first black actor to punch a white actor on screen. Ben also cared about the people he was holed up with. He was always taking care of Barbara and punching the basement dad if needed. I got sad when the militia shot him in the head because they thought that has was a ghoul. So, did the film scare me? Yes, it did. I found the film incredibly scary and, after finishing that viewing, swore that I would never watch the film again. I had trouble sleeping for about a week, but I never told my parents that I watched the film. I feared that I would get in trouble and I didn’t want that. When I got older, I watched the film again and found it less scary, but still very entertaining. The film is very fun and scary and I would tell anyone who is on the fence about watching this because it is “old” or in black and white to just get over and watch this masterpiece of a film. The blu-ray, from The Criterion Collection, is amazing. The picture has never looked better and should be the standard in which all other 4K restorations should be judged. The sound is good too, but nothing earthshattering. The special features are also great. The new and old, mixed together, it doesn't get much better than this. This blu-ray belongs on the shelf of every horror.